Based in Worcester, MA, the Petty Larceny Band is the premiere Tom Petty and the Heartbreakers Tribute band playing throughout the New England area. For the past 8 years this band has covered all of Tom Petty's many great hits and also deep cuts with amazing accuracy, adding songs by the Traveling Wilburys, Mudcrutch and other Classic Rock songs to the mix. Last year the band was featured at Foxwood's Casino in Connecticut, Indian Ranch in Webster, MA, the Hampton Falls Bandstand in NH and Bentley's in Maine. This band has a great lineup of talented, experienced musicians and a dead-on sounding Petty vocalist. Petty Larceny always gets the crowd's heads nodding and feet dancing. If you like Tom Petty's music, you will LOVE the Petty Larceny Band! Echoflash is redefining the 80’s musical journey, engaging audiences with the hits, energy and passion that defined a generation. Channeling an authentic 80’s look, Echoflash is not your typical cliché 80’s cover band. They flawlessly deliver spot on renditions of your favorite 80’s songs with high energy, world class musicianship and unmatched professionalism, taking your 80’s experience to a whole new level! From the power of Journey and Bon Jovi, to the funk stylings of Michael Jackson and Prince, combined with the memorable licks and lyrics of glam rock and everything in between, Echoflash covers it all with unmatched perfection. Artists covered include: Journey - Bon Jovi - Europe - Prince - Joan Jett - Loverboy - Whitesnake - Van Halen - Survivor - Billy Squire - Poison - Pat Benetar - Michael Jackson and more! The R&B all female funk band KLYMAXX is KLYMAXXTIC! Still going strong their music is a staple on the radio and in dance clubs around the world. Belting out hits like, “The Men All Pause” and “Meeting in the Ladies Room” the group’s name is synonymous with classic women’s anthems. Their beautiful ballad, “I Miss You”, was Billboard Magazine’s #3 song of 1986 and still to this day is played when love is in the air. Continuing into the 90’s with the #4 R&B hit, “Good Love” followed their sultry Neo-Soul groove entitled, “Private Party” showed evident that they could flow with the changing music trends. Much of the group’s success can be credited to Cheryl Cooley, Co-founder and original member. She has personally nurtured the group’s unique sound by overseeing the infusion of 80’s funk with a modern swag. Her enthusiasm and vision have transformed KLYMAXX into a leaner meaner entity producing live music that delivers dynamic vocals and uncompromised grooves. These ladies are serious about entertaining their fans and continuing with the KLYMAXX legacy. Taking their name from the popular mixed drink, The Manhattans began their legendary musical journey. After placing third in a competition at the Amateur Night at the Apollo Theater, their undeniable musical star power earned them their first recording contract. Joe Evans, a former Motown musician, who had started Carnival Records eagerly signed The Manhattans. It didn’t take long before their first major hit “I Wanna Be (Your Everything)” broke onto the Pop and R&B charts. And the hits just kept coming. With “Searching For My Baby” and “Follow Your Heart” selling records by the hundreds of thousands, the group was on their way to national recognition. In a mere three years, songs like “Baby I Need You” and “I ‘m The One Love Forgot” firmly established The Manhattans a place in musical history. This earned the group NATRA’s “Most Promising Group” award. After moving to King Records (Deluxe Label), their smooth sound and repeated quality songwriting, soon brought court from Columbia Records, a subsidiary of world renowned CBS. This accomplishment afforded them the power of self-producing and collaboration on their albums. From their inception and throughout their career, with their classic songs “There’s No Me Without You”, Kiss And Say Goodbye” and “Shining Star”, The Manhattans set a new RIAA standards for platinum sales. Numerous awards and a Grammy proved again just how resplendent the group had become to their artistic community and the hearts of their fans. Throughout the decades, with one enduring song after another, this exalted super group continues to leave their mark on the world-touring stage. They perform at numerous charity events and make appearances at lofty high profile festivities such as former President Clinton’s Christmas Gala. The late “Original” founding member Edward “Sonny” Bivins vowed to preserve the integrity of this priceless musical gem. He gathered the vocal styling of Charles Hardy, Harsey Hemphill, Alvin Pazant & Kenneth Jackson, to complete the modern day lineup and seek out new horizons. The group continues to record and perform songs, with melodies and harmonies that few of us will ever forget. This lineup carries forth, the musical tradition of The Manhattans for generations to come. Harold Melvin and The Blue Notes legacy band member Lloyd Parks, the only surviving member of the original band has given his blessing for The New Blue Notes. The Legacy will live on and prosper in the new era. The American R&B and Soul vocal group that hit the Philadelphia scene by storm in the 1970's is alive and well in the form of The New Blue Notes. Teddy Pendergrass and Harold Melvin's legend lives on through band leader Bernard Fullen, said to vocally resemble Teddy Pendergrass. About Mr. B- Benard Fullen: Hailing from North Kingstown, he started singing at the tender age of 8 years old. He started singing in the church choir. After church services he would sing (doo woops) with people such as: Tiny Tavares, of the Group Tavares, Ben Powers, from the TV show Good Times and Mr. Manny Barros, who was his inspiration and mentor. Jeffrey Osborne and he were stable mates. They both crafted their skills in Manny's mother's basement, later tagged Alice's basement, where many of the youth practiced. There, they learned to sing and dance versions of the hits of Motown. Unlike Tiny Tavares, Ben Powers, and Jeffrey Osborne, who went onto fame. Benard pursued another carrer path in business at the time. It was his dear friend Manny Barros who inspired him to visit the passion and to sing once again again publicly. Music has always been his passion and his first love. It was a pleasure to embrace his friends presence once again. In 2010, he was invited to join the group "The Denny Terrio Dance Party" with the legendary Denny Terrio who was the dancer who taught the actor John Travolta how to dance in the movie Saturday Night Fever. He became one of the lead vocalists for the group, and it felt good to sing a note. One year later, he received a telephone call from Lloyd Parks who is the only surviving original member of the group, "Harold Melvin and the Bluenotes." He was then invited to become the lead vocalist for the legendary "Lloyd Parks and His New Bluenotes." He humbly accepted the offer and still remains the lead vocalist today. He also performs tribute concerts to "Mr. Teddy Pendergrass" upon request. Theo Peoples (born Theoplis Peoples, III on January 24, 1961 in St. Louis, Missouri) is an African-American R&B/soul singer. The son of a preacher, he performed at local landmarks, like the Al Baker’s and Seventh Inn, pursuing solo success before being discovered by Ron Tyson at the Majestic Hotel in St. Louis. Peoples was chosen to replace Richard Street in the legendary Motown group The Temptations in 1992. His first recordings with the group were released in the box set Emperors of Soul (1994) where he sang lead on "Givin' U The Best," "Elevator Eyes" and "Blueprint For Love." Renowned music producer, Richard Perry, worked with the Temptations to make the album For Lovers Only (1995) and included the song "Night and Day," on which Peoples sang lead vocals. The track was later featured in the film What Women Want (2000). After Ali-Ollie Woodson left the Temptations in 1996 due to his battle with throat cancer, Peoples assumed the role of lead second tenor/baritone for the group. Although he was replaced by Barrington "Bo" Henderson before the album's release, Peoples made significant contributions to the multi-platinum and Grammy Award nominated Phoenix Rising. He wrote and sang "This Is My Promise” and sang lead on the group's #1 hit "Stay.” Six months after parting ways with the Temptations in 1998, Peoples was asked to join the Four Tops, another classic-era Motown act. The group had recently lost original member Lawrence Payton, and the remaining Tops hand-selected Peoples to take his place. When lead singer Levi Stubbs had to cease touring, he handed Peoples the torch, giving him his personal blessing to take over as the Four Tops’ front man. Peoples continued to tour and perform with the Four Tops until he left the group in 2011. As a member of the Tops, Peoples is probably most noted for his performances of "Always and Forever," a track originally released by the funk group Heatwave in 1977. The song was featured in The Four Tops 50th anniversary live special, From the Heart (2004). Earning the singular honor of the only man to be a member of the Temptations and the Four Tops, Peoples has performed for Presidents Bill Clinton and George W. Bush. He has also had the opportunity to perform with Aretha Franklin, the Queen of Soul, and perform at the Super Bowl XXXII Halftime show. Peoples has released several solo albums including Down Time (2000), Listen 2 Your Heart (2002) and Chemistry...You and Me (2004). 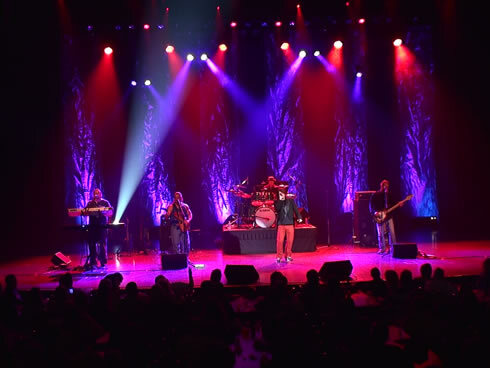 Paying tribute to the greatest Billboard hits from one of the most influential and musically diverse eras ever, the 70's PROJECT takes you on a spectacular trip back to the 1970's and the quintessential musical styles that defined an era and inspired a generation. From Peter Frampton to Wild Cherry, from American Pie to That's the Way uh huh uh huh, the 70's PROJECT recreates a truly magical musical experience that will have you signing, dancing, and longing for your bell bottoms and lava lamps once again! Bringing the unforgettable songs of Motown back to your venue is "The Magic of Motown". This dynamic and driving tribute spans more than a decade of Motown classics -- every one of the songs performed are among the most recognizable and culture-defining songs in pop music history. The show features four of the best male vocalists performing Motown music in the US today and one female singer to accommodate the great female vocalists of that era. The show features the great harmonies and choreographed dance steps of the Motown era and features a 6 piece back-up band that is a show in itself. The musicianship is second to none and many of the players have backed up or opened up for many of the original Motown artists. David Powers is a singer, songwriter and multi-instrumentalist known for his guitar virtuosity, on stage charisma and as an artist who can do it all. A seasoned performer, he takes inspiration from a variety of musical genres and flawlessly blends them into his own unique, unforgettable acoustic renditions. At an early age, David began playing guitar and drums and honed his skills playing local clubs throughout the tri-state area. In the 1980’s his original rock band, Rock Alley, opened for and performed with over 100 nationally touring acts including: David Lee Roth, Dokken, Ratt, Twisted Sister and Winger. In 1988, David founded Starr Ridge Studios and successfully built one of the top audio and video production studios in New York. Working with over 3000 artists, under David’s guidance, Starr Ridge Studios has been nominated for 3 Grammy’s and 1 RIAA Award. In addition, since 2000, David has owned Mindride Enterprises, home to Mindride Music and Mindride Records. As an artist David has released two highly acclaimed solo albums. His debut Album, POWER OF ONE (2006), features David not only engineering and producing the album, but singing and playing every instrument on the record which resulted in two songs charting in the Top 20 of Sound Clicks Rock Chart. LOUDER, released in 2009 includes a full band, infectious melodies and David’s legendary guitar playing. Additionally, in 2006 David was a top three finalist, out of 2800 entrants, in Guitar Player Magazine’s GUITAR HERO competition. Since 2010 David has focused on the pursuit of a solo career, primarily as an acoustic artist as well as fronting the highly applauded acoustic trio Miss Leading The Blind. He also regularly performs for Operation Smile and the Smart Kids with Learning Disabilities events in New York. David’s endorsements have included Michael Kelly Guitars, Buddha Amplifiers, D’Addario and Fender. The Ronald Reagans BIG '80s Show is a 1980's tribute band based out of New York City. This fully-costumed act performs a family friendly, high energy show fit for all ages. The band has performed for the U.S. Congress, shared the stage with Jimmy Buffett, rocked with celebrity chefs Guy Fieri and Andrew Zimmern at the NYC Wine & Food Festival and has played from Boston to The Bahamas. 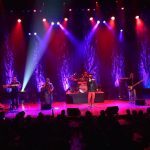 The Journey Experience”, is the closest re-creation you will see to THE supergroup of the 70’s and 80’s. An absolutely dynamic stage show with four part harmonies live that other bands could only dream of doing. The Internationally touring tribute act performs a 2+ hr concert with all the sights, sounds and of course songs that made Journey famous the World over. Come see “SCARAB..” and “Experience” what Hundreds of Thousands of fans all over the Country are raving about.